So this is what I do when I’m not worrying about work or writing…. I started my meal prep yesterday… I’m going for a small, alternative Thanksgiving feast. I made a few alterations, adding cream sherry instead of rum to the tiramisu, and some red peppers and olives to the lasagna’s meat sauce, but stuck to the rest of the ingredients. I used my trifle dish instead of the springform pan listed in the recipe, and sprinkled chopped pecans instead of cookies for the presentation. I just finished the meat sauce for the main dish, but I’m going to prepare the layers later today and then cart myself over to my mom’s house for the actual baking. Should be quite impressive when it’s all put together. 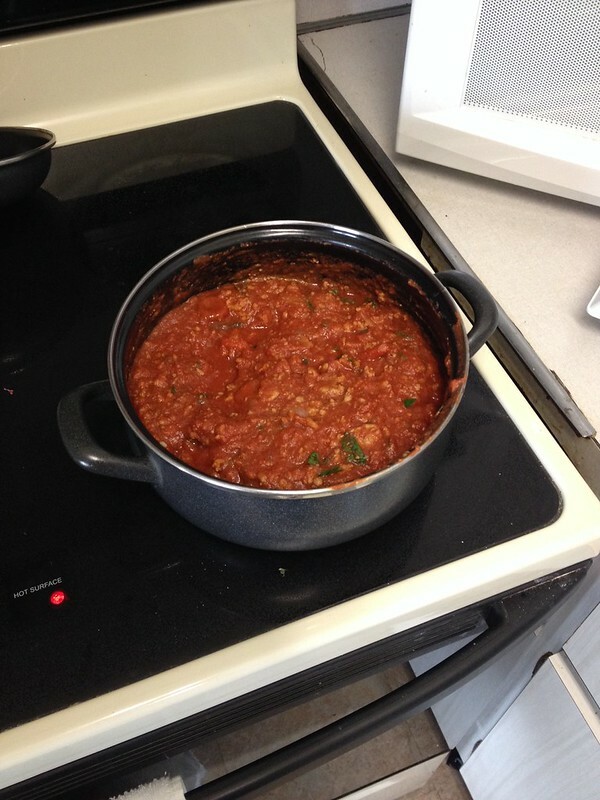 Here’s the sauce… it’s a lot thicker than I expected, which is good. I was concerned that it would be too watery. And because I can’t help myself, there will be a traditional pumpkin pie… just waiting to bake it at my mom’s place. There will also be some extra dishes courtesy of the boy. It’s been a while since I’ve posted a recipe post, but this one was a special request that turned out better than I had imagined, so I just have to share. Last weekend, I made Nigella Lawson’s Boozy British Trifle, a drunkenly masterful concoction full of creamy, fruity, sherry goodness. I made it for a rather silly reason–a cook-off between me, the boy, and his friends to celebrate the Hell’s Kitchen season finale with British themed eats. Dessert seemed like a good idea at the time and the boys claimed trifle is Gordon Ramsay’s favorite dessert (this is part of their Hell’s Kitchen/MasterChef mental database of useless knowledge). So I scoured the internet for a good, authentic recipe and settled on this one, as posted on Dash Recipes. 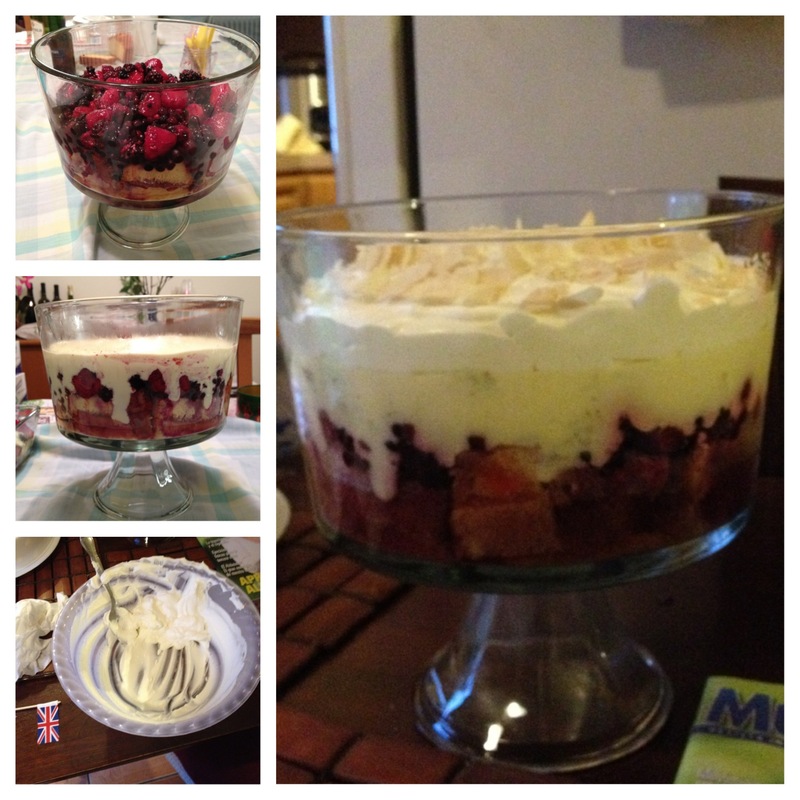 The trifle in all its boozy glory! 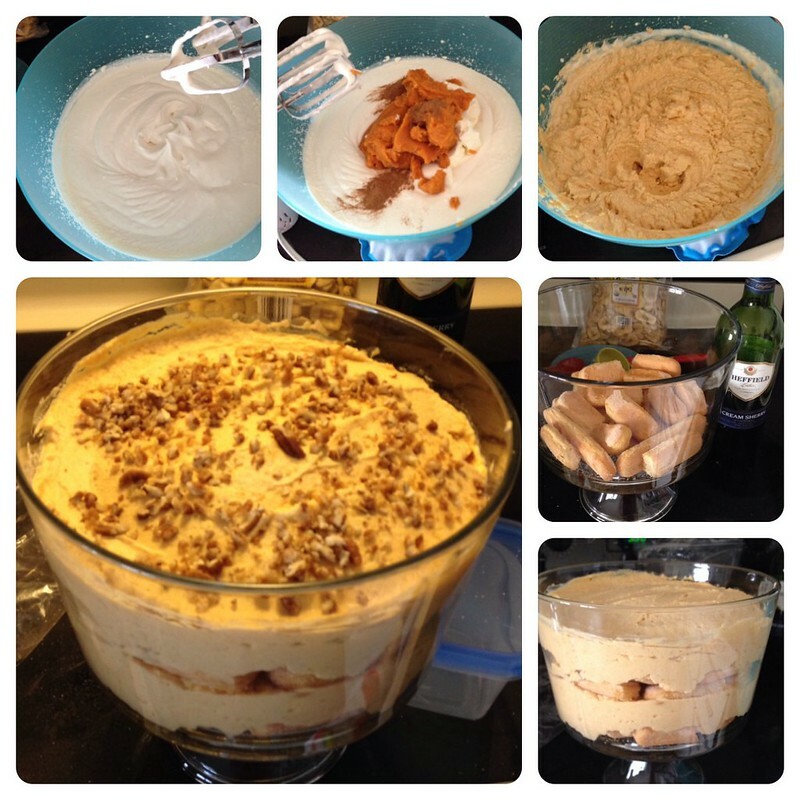 Other than a couple of substitutions–1/2 tsp dried orange peel for fresh orange zest and almonds for the pistachios and candied roses, I followed the recipe to the letter and produced a trifle and a half. Mostly because my trifle bowl was not as ginormous as the one pictured on the site, so I had enough leftover to make a smallish trifle as a tester. It was delicious! Overall, this is a simple, easy to make recipe that can produce an amazing looking dessert, but you need to be aware that you need to refrigerate it for at least 12 hours before pouring on the final, whipped cream layer. 2 days is best (really, it makes a big difference as far as flavor). I used a nice cream sherry for the wine base and it went very well with the mild cream layers and the sweet fruits. This is a time-consuming dessert, but well worth the effort if you plan it out well and use good ingredients. For the cake, I recommend a drier sort of vanilla pound cake, rather than a butter loaf, as it will absorb the alcohol and juices better than a moist cake. And, yes, I won the contest… although I think the boys were just too scared not to give it to me after I told them how long it took me to make this thing.